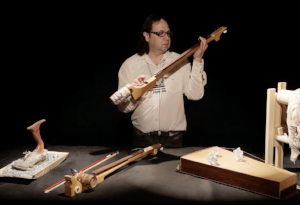 Saratoga Springs, NY (January 22, 2018) — The Tang Teaching Museum at Skidmore College will present works by experimental composer and multi-media artist Guillermo Galindo in its exhibition Along the Border. Featured are several of Galindo’s “cybertotemic sonic objects” crafted from discarded items found at multiple sites along the 2000-mile national border between Mexico and the United States. These works made from discarded cans, animal bones, shoes, bicycle wheels, leather, children’s toys, and more, reveal the human impact of the evolving economic, social, and political relationships between the two nations over the past several years. On view from February 17, 2018 to April 22, 2018, Along the Border will also feature a work from Galindo’s Flags series, which consists of graphic scores printed onto weathered flags found at the border and originally used to indicate the presence of water tanks stationed in the Calexico desert. Each flag features a unique system of notation, from straightforward rebus-like instructions to the abstract, inspired by the tradition of composers like John Cage and Cornelius Cardew. Additional programming for Along the Border includes a performance at the museum by Galindo of his original composition Sonic Borders II on March 20, 2018, at 6:00 pm and a workshop on resonance and sonic healing by Galindo on March 21, 2018, from 8:45-10:00 am. Guillermo Galindo is an experimental composer, sonic architect, performance artist and visual media whose work redefines the conventional limits between music, the art of music composition and the intersections between all art disciplines, politics, humanitarian issues, spirituality and social awareness. Galindo’s artistic practice emerges from the crossroads between sound, sight and performance and includes everything from orchestral compositions, instrumental works and opera, to sculpture, visual arts, computer interaction, electro-acoustic music, film making, instrument building, three-dimensional installation and live improvisation. In 2012, Galindo embarked on a collaborative series entitled Border Cantos with photographer Richard Misrach to explore the United States-Mexico border through image and sound. Misrach has documented the border since 2004. After meeting Galindo during a chance-encounter in 2011, Misrach began collecting items he discovered during his travels and sending them to Galindo, who then transformed them into sculptural sound devices. Border Cantos was exhibited nationally between 2016 and 2017, traveling to the San Jose Museum of Art; Amon Carter Museum of Art, Fort Worth; and Crystal Bridges Museum of American Art, Bentonville; and Pace Gallery and Pace/MacGill Gallery, New York. Galindo’s graphic scores and three dimensional sculptural cybertotemic sonic objects have been shown at major museums and art biennials in America, Europe, Asia and around the world including documenta14 (2017), Pacific Standard Time (2017) and CTM Festival (2017). HIs work has been featured on: BBC Outlook, Vice Magazine, RTS Switzerland, National Public Radio, CBC, California Sunday Magazine, Reforma Newspaper, CNN and the New York Times.